many of the symbols that signal the beautiful days ahead. that measures 36" end to end. which are available from Silhouette America's online store. simple wire "vines" or wrapped "stem" to allow the cluster to extend downward from the end knots of jute string, netting, and varied ribbons. 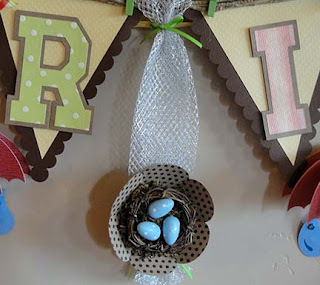 At the center hangs a miniature nest with plastic commercial bird eggs in a tiny twig nest. These are cushioned by natural Spanish moss nestled in a scalloped paper bowl and suspended on metallic netting. If it is fair play to have a favorite among so many outstanding shapes, the water can would be the one I choose. Though it looks complex, it really goes together very quickly and intuitively. 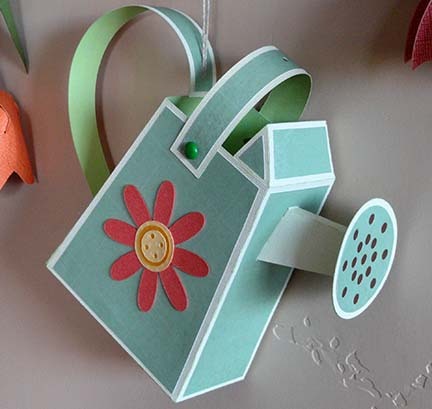 I added a few details to make this rendition personal: contrast smaller circle behind the perforated spout plate; colored brads at the upper handle ends; pink daisy with layered button center. Half of a dimensional umbrella is another shape that dangles from the swag. Pink pearl beads glued near the fold "center" help the slice-form shapes stay in position. 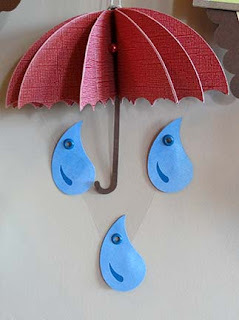 Below, three super-sized raindrops are connected to the "invisible" transparency sheet cut triangle that keeps them in place, too. SIMPLIFY? Once again I have failed to keep my creativity in check. Perhaps you would leave some of these elements off, but in case you are interested to incorporate any of these in your seasonal projects, below is a list of the files I used. 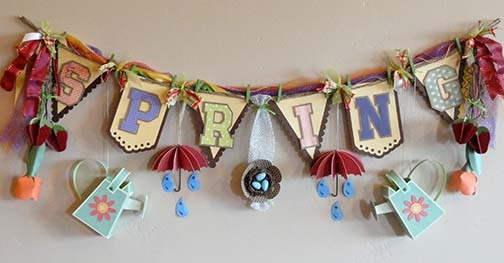 I saw your wonderful spring swag on the Silhouette Flicker group and have to say I think this is one of the neatest Spring Banners I have seen!! Great job! Love all the 3d additions. 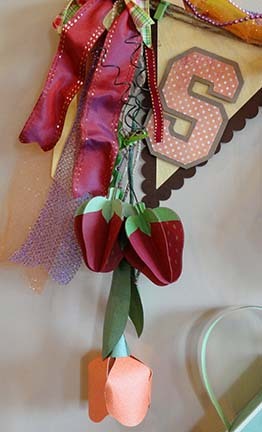 April On the Docket Kit Chart - Quilts, Etc.